What would Narendra Modi do? Would Gujarat’s chief minister harness the fiscal deficit and manage India’s economy well at a time such as this? Would he puff up corporate confidence? Would he be able to handle combative coalition partners better than Manmohan Singh? I cannot say. Modi can’t either. Because he has never run a coalition. Or come close to running one. Modi inherited the BJP’s two-thirds majority when he was made CM in 2001. Gujaratis had been seduced by Hindutva long before Modi. The Congress lost power in the state in the 1990s after the Babri Masjid was torn down, and has shown little sign of mounting a resurgence since. And so Modi has ruled a state whose population shares his party’s dislike of Muslims and love of big business. Demagoguery comes with a natural ease in such circumstances. Modi has never had to build consensus as Manmohan Singh has had to; on laws, on policy, on administration. He has faced no pressure from his party over social spending for Bimaru states, no pressure from coalition partners to keep reversing reforms. But what if he were forced to? Let me speculate as someone who knows him and has worked for a Gujarati newspaper in Ahmedabad. Gujaratis not as traders, but as shopkeepers, neighbourhood grain and oil sellers. Unlike the trader, the shopkeep operates on fixed rates. He does not negotiate and has no need of compromise. To negotiate, one must accept the limitation of one’s position. Whether that position is right, or even moral, is irrelevant. Manmohan Singh is a fine leader, and a good man, because he operates modestly within the confines of his limitations. He is able to swallow the humiliation that comes from the repeated ceding of his opening position. But since his government is dependent on allies, he persists, preferring tactical retreat to martyrdom. Why inflict this on those visiting the portal? The fact is: Modi cannot help himself. When one is so supremely talented, so dazzlingly faceted, what is one to do? It is not difficult to see how a negotiation between obstinate allies and vainglorious Modi would go. As a man, he is “popular and progressive, a poet and author of three books, tech-savvy and a true democrat”, according to the same site. This is untrue. In reality, he trusts few of his colleagues and is easily threatened. He has never entirely entrusted the home ministry to another. The blame for all the incompetent policing and sloppy investigation during and after the 2002 riots can be laid directly at Modi’s feet, who is also Gujarat’s home minister. He has no enthusiasm for internal democracy, leave alone for sharing power. He still skips functions because the RSS has rehabilitated one of his enemies, Sanjay Joshi. He will be a poor manager of coalitions (expect lots of sulking), and none-too-good at finding compromise. And regarding the matter of corporate confidence, it is clear that India Inc wants Manmohan to do more. It’s clear also that Big Money loves Modi. Could he repeat his magic in Delhi? 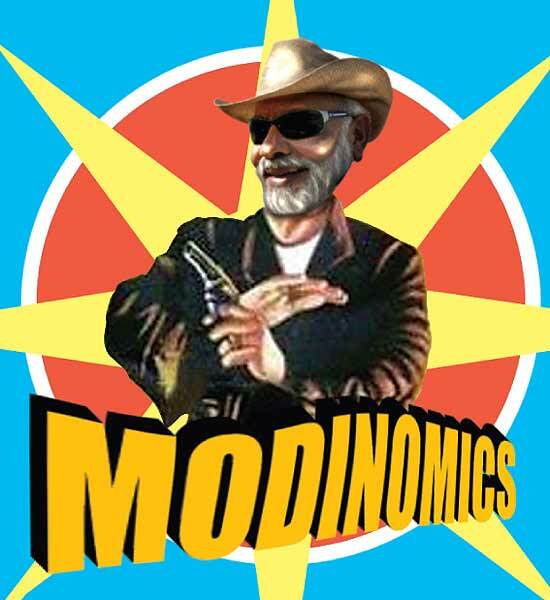 Gujaratis laughingly refer to Modi as Draupadi, who must service five Pandavs (Essar, Adani, Tata, Ambani and Torrent). Gujarat has been most kind to these men by way of policy. Is it a coincidence that the ministry portfolios vital to Adani (ports and mines), Mukesh Ambani and Essar (petrochemicals), Tata (industry) and Anil Ambani and Torrent (energy) are all with Modi? It is easy to be industry-friendly when one has absolute power. Hand Modi a two-thirds Lok Sabha majority, control of all the ministries he wants, and he might be able to govern India firmly. That may not be the same thing as governing India well. Next Story : What’s Behind The Wall?